Let’s face it. Kids and food spills go hand in hand – but they certainly don’t have to get out of hand. 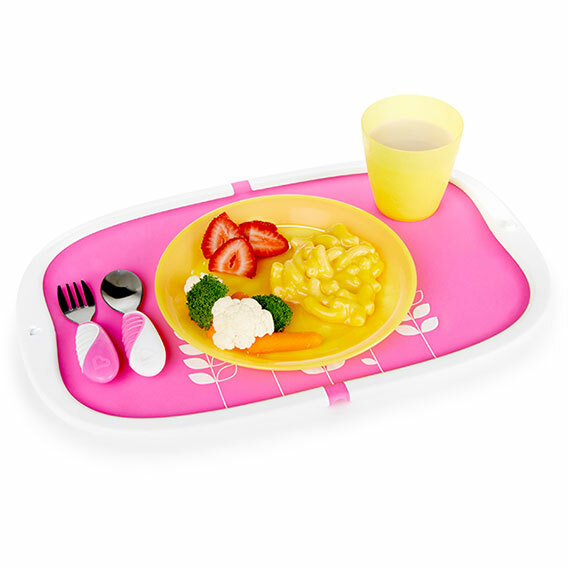 Our portable silicone placemat has super gripping powers, keeping it securely attached to the table while kids make their way through meals. Little ones love the fun animal designs, and moms love the raised plastic edge that keeps crumbs and rogue meatballs on the mat instead of the table or floor. After the fun is over and bellies are full, you can fold it up, snap it shut, and whisk it off to the kitchen for quick, easy cleanup in the dishwasher or sink. It’s perfect for dining at home, but also great for on the go, as it keeps food and hands off grimy tables, too. Mealtime just got a lot easier to swallow.